Eady's Landing community is sold out and is not in active development by builder. 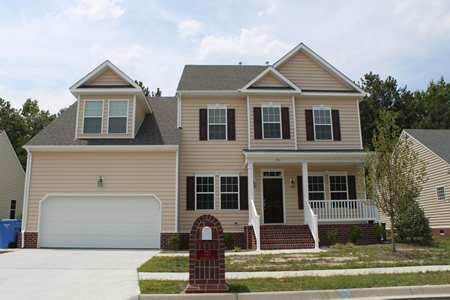 If you are interested in Eady's Landing or similar new home communities, contact us today! Our agents are very familiar with new and newer construction in Chesapeake, and can identify resale opportunities in Eady's Landing, as well as builder inventory available in nearby or similar communities in Chesapeake. To view 10 more pictures, interactive maps and the full, detailed description of the Eady's Landing community, please Login. Newer homes are as pretty as they are tough in this community located in the Deep Creek area of Chesapeake, VA. Military members can rest assured knowing they have an easy commute to and from this home base to Norfolk Naval Shipyard, the Coast Guard Finance Center and Naval Medical Center Portsmouth. Homebuyers looking for long-lasting value in a forever home, look no further than this pleasant nook of houses. Checking out real estate for sale in Hampton Roads can be a challenge. When buyers know they want newer homes in a desirable location, they can narrow down their search to a neighborhood like Eady’s Landing. Each of these newer homes may include side garage door, foundation with crawl space, full brick skirt, 30-year architectural shingles, landscaping package, wood deck and more. But the outside of these homes is just the beginning. Each of these houses come with hardwood flooring, gas fireplace, nine-foot ceilings, brushed nickel light fixtures, GE appliances, garbage disposal, natural gas heating and much more. Virginia has so many beautiful areas and Chesapeake is certainly one of them. This bustling metro region is filled with fun things to do and fun people to do them with. New construction is everywhere indicating this place will keep adding even more places to shop and dine. Take up golfing at Cahoon Plantation or Chesapeake Golf Club. Enjoy nature’s splendor of trees, wildlife, wetlands and vegetation in the Dismal Swamp State Park. Considering buying real estate for sale can be a monumental decision. Take some time to think about what the community as a whole can offer you. New homes may come and go but the feeling of belonging in a neighborhood stays indefinitely. Send me more information about communities similar to Eady's Landing. Our agents gladly offer FREE property tours of Eady's Landing, Chesapeake and homebuyer consultations to all serious buyers.